We spent our first Halloween as Florida residents trick-or-treating at Fort Wilderness tonight. We had a great time and we're already looking forward to going back next year. So many guests did an amazing job at decorating their campsites, and some even constructed elaborate Halloween "displays." This photo shows one of our favorites. It had life size automated mannequins, skeletal remains, and even a ghost effect similar to what is seen in The Haunted Mansion! There was also a golf cart parade, where guests decorated their carts and were judged by a panel from Disney. 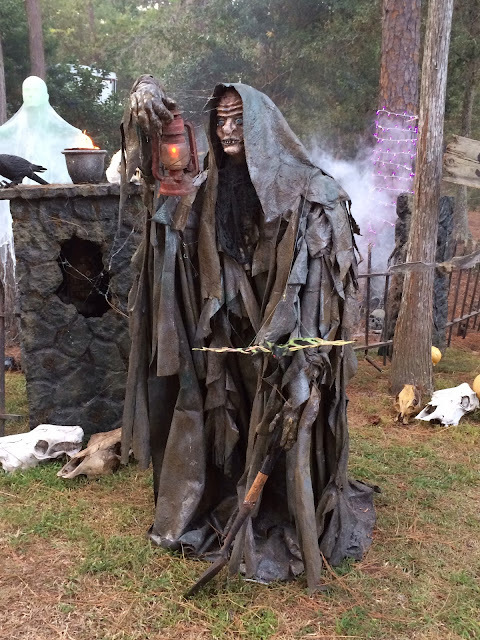 It was a great event and I definitely recommend Fort Wilderness as THE place to go on Halloween when visiting Walt Disney World. 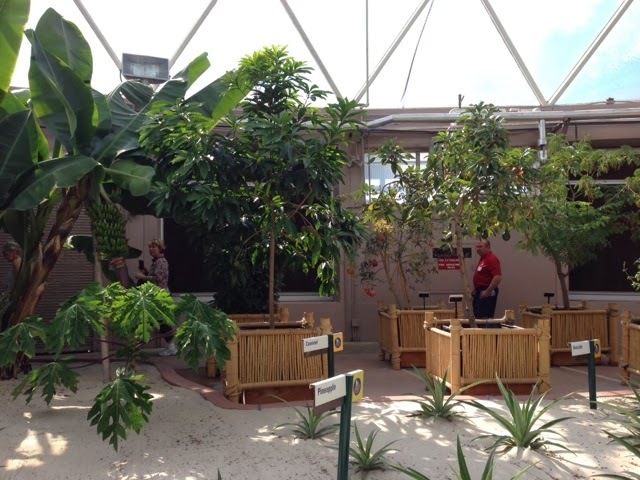 This shot was taken inside the Living with the Land greenhouse section. This opening day Epcot attraction was originally called Listen to the Land, and it used to be narrated by a "live" cast member. Although it has gone through some changes, it is still basically the same ride that debuted back in 1982. The people you see in the background of this photo were on the "Behind the Seeds" tour. I took this shot while visiting the Magic Kingdom yesterday. 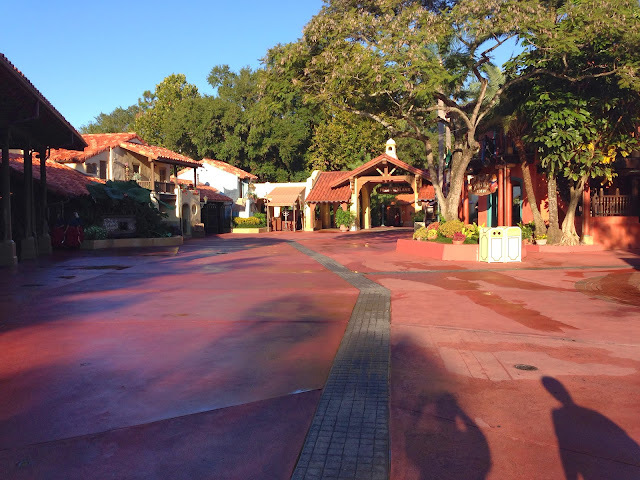 This empty view of Adventureland can only be seen for a short time each morning, just after the park opens. Most of the crowd goes to the right after walking up Main Street, and you will find sparse crowds toward Adventureland. My tour guests are certainly happy to start their day in this area! 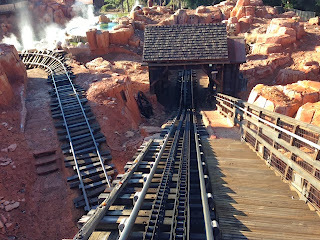 This morning, my family and I got to Thunder Mountain right after the park opened and rode it twice. The second time around, the cast members told us to sit anywhere we'd like, so my son and I jumped in the very back row. As I'm always looking for different perspectives in my photography, I turned around and got this shot as we were climbing the second hill. Like most roller coasters, the sensation of speed is heightened form the back car as it feels like you are accelerating up and over the hills. If you ever decide to take a photo like this, just make sure you are holding tightly to your camera or (in this case) your iPhone! 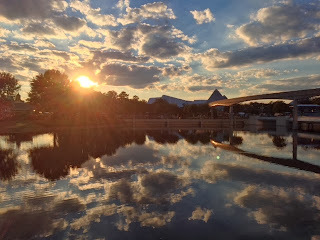 A few weeks ago I was near the entrance to Epcot around sunset. 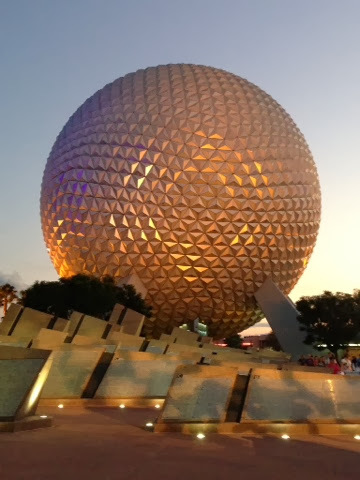 Spaceship Earth looked great in this light so I took several shots of this iconic structure. At 180 feet tall, this attraction is impressive no matter what time of day it is. It is fun when many of my tour guests first hear me say that there is actually a ride inside the gigantic "golf ball." As amazing as it is to look at from the outside, it is truly an engineering marvel on the inside. I snapped this shot just after exiting Space Mountain on the PeopleMover the other day. The timing was perfect for this quick train photo. What you see in this picture explains why the queue ramp goes down and then back up again. 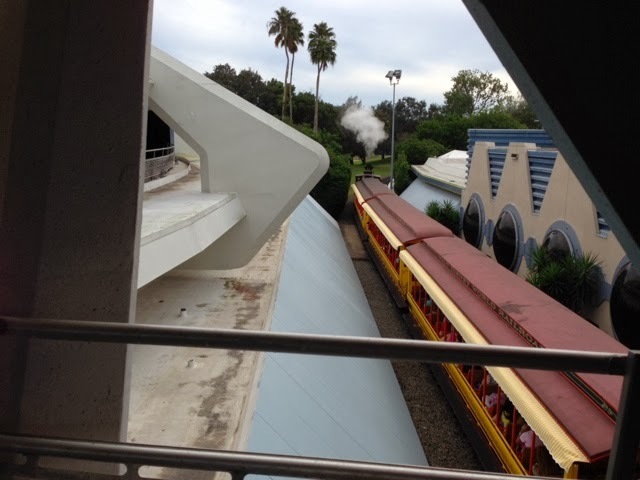 Guests need to get below the train tracks in order to get Into the actual Space Mountain building. So in addition to making the line more interesting, the sloped ramps actually have a practical purpose for existing. Not too long ago, I was on The Great Movie Ride and my ride vehicle stopped right in front of the wicked witch from The Wizard of Oz. Of course I had to snap a few pics. Although this series A-100 is nearly 25 years old, it is still one of the most advanced audio-animatronics in all of Walt Disney World. It is truly amazing how lifelike this figure appears. 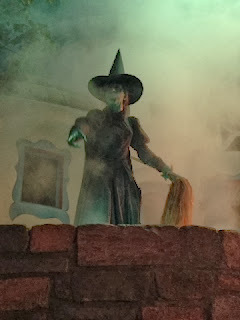 It is also fun to see the cast member host interacting with the witch during the scene. When Disney builds a new attraction in a spot that was occupied by an old attraction, they typically pay homage to what was there previously. The Under the Sea ride in the New Fantasyland area of the Magic Kingdom is no exception. For the first three decades of this park's existence, 20,000 Leagues Under the Sea was located here. 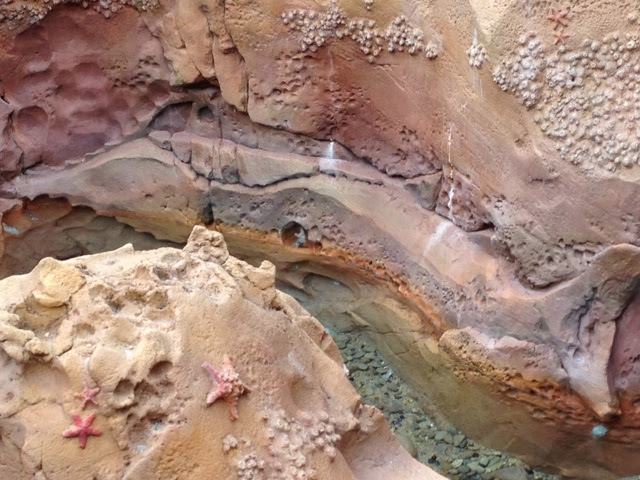 In a tribute to that classic attraction, you can see the outline of a submarine in the rocks of the queue, just before you enter the cave area of Prince Eric's Castle. I took this shot today, while enjoying some time at the Magic Kingdom with our son. 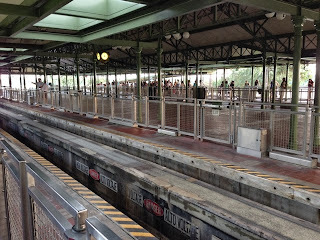 Although I have taken many photos of monorails over the past several years, I have yet to post a shot of the Magic Kingdom station on its own. There is nothing particularly interesting or flashy about it, but it is the spot where millions of guests arrive at the world's most popular theme park each year. I was waiting for the express monorail back to the Transportation and Ticket Center when I snapped this shot last week. We watched Happy HalloWishes from the beach of the Polynesian Resort tonight. This amazing fireworks display takes place over and around the Magic Kingdom during the Mickey's Not So Scary Halloween Party. 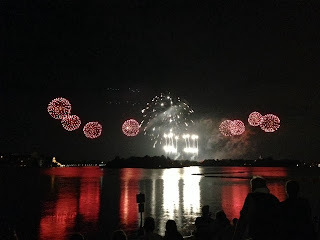 This shot includes the "perimeter" fireworks that can be seen as part of the finale. The Polynesian is one of the few places where you can see ALL of the fireworks in the same view. Although it is fun to actually be inside the park for the Halloween party, you simply don't get this amazing view when you are there. Also, they do play the soundtrack to the show at the beach, so you still get the synchronized music and fireworks. 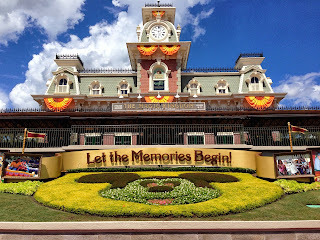 In the nearly three years writing the Digital Disney World blog and two years giving private guided tours, I have been fortunate to meet many interesting people in the Disney fan community. I have also made some great new friends during that time. Although most of these folks have a passion for Walt Disney World, there is one who sticks out from the rest, and his name is Brent Dodge. Brent is a self proclaimed Disney nerd, as well as successful Disney podcaster, blogger, and historian. He has spent over 2,000 days in the Disney parks as a guest and holds the record for visiting the most days in a row. Simply put, Brent goes to Walt Disney World every single day! As somewhat of a Disney "nerd" myself, I have read most of the books on the subject of Walt Disney World, and I'm always interested in anything new that is related to the "most magical place on Earth." I thoroughly enjoyed Brent's first book, From Screen to Theme, and I was excited to hear that he completed his second. The new book is called A Closer Look: At the Magic Kingdom's Fantasyland, and I just finished reading it this week. Although I don't typically do book reviews, I couldn't pass up the chance to write about this little gem. Brent did a nice job in the sequencing of the book. He starts with the park's icon, Cinderella Castle, and takes us on a literary tour around Fantasyland. After leaving the castle courtyard, he heads us to the right toward The Many Adventures of Winnie the Pooh, around the Mad Tea Party and down into Storybook Circus. We then learn all about New Fantasyland before finishing up with the classics and the transition into Liberty Square. At the end of the book, Brent discusses the "past attractions" that many of us remember enjoying from days gone by. Throughout A Closer Look, he does a great job of mixing the right amount of history with what is actually located in Fantasyland today. Although this book can be enjoyed from anywhere, it is a lot of fun reading it inside the Magic Kingdom. It is great to be able to immediately see (with your own eyes) exactly what Brent is describing throughout Fantasyland. A Closer Look acts as a virtual tour guide, and you can almost hear the author's voice coming to life as he accompanies you on your journey through the park. 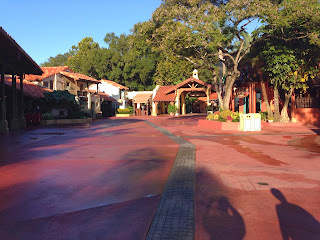 There were a few details in Storybook Circus that I read about and couldn't wait to check out. Thankfully, since I was perusing that chapter while riding The PeopleMover, it was only a short walk past Space Mountain to the location I was reading about. Although I read a majority of the book at home, I think it works great as a reference guide while strolling through the park. 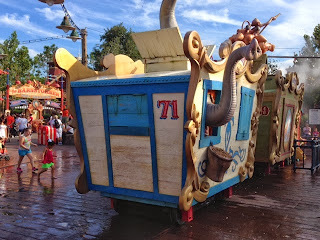 I highly recommend A Closer Look: At the Magic Kingdom's Fantasyland. It is simply a must read for every fan of Walt Disney World. I am hoping that this is just the first in a series of Closer Look books from Brent Dodge. After finishing this story about Fantasyland, I couldn't help but want to hear more about the Magic Kingdom. I actually hope that Brent will write similar books for each Walt Disney World park. It couldn't be easier to get your hands on this book as it is available in the Amazon Kindle Store for only $0.99! This means you can read it on just about any portable electronic device, which makes it easy to bring it to the Magic Kingdom with you. If you like the feel of an actual book in your hand, you can order a copy over at Brent's website, FromScreentoTheme.com for $8.99. 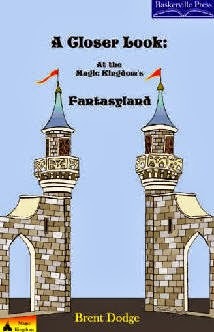 Either way, A Closer Look: At the Magic Kingdom's Fantasyland should be in your library as soon as possible. It is truly a great book! Here is another shot from our stay at Pop Century last month. This is the 80s section of the resort. As a child who grew up during that decade, it is definitely my favorite area. You can see so many references to that era in this picture, like the Walkman, the PacMan characters, and the breakdancers. When I took this photo I, was standing on the edge of a giant computer keyboard that is actually facing toward the 90s building. A few weeks ago our son was studying fossils in school, so I thought it would be fun to take him to the Dinosaur attraction at Animal Kingdom. Although we normally use FastPass for this ride, I wanted him to see some of the interesting stuff that can be found by slowly walking through the "standby" queue. 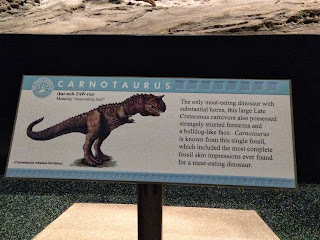 This description of the Carnotaurus can be found next to the giant skeletal model of this Dinosaur. 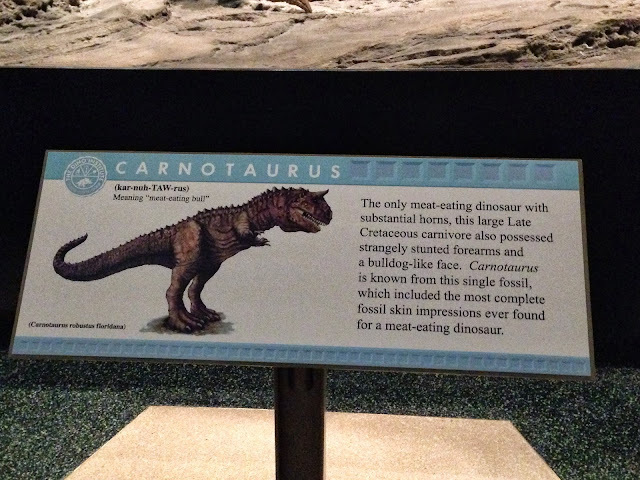 Although T-Rex is typically the most popular of the meat eaters, the Carnotaurus is the star of this attraction. This past Tuesday I had the chance to catch the debut of the "Glow With the Show" ears at Fantasmic. On the way to the theater, I liked the way Tower of Terror looked with the setting sun illuminating it. I took this shot using the "tonal" mode on my iPhone. 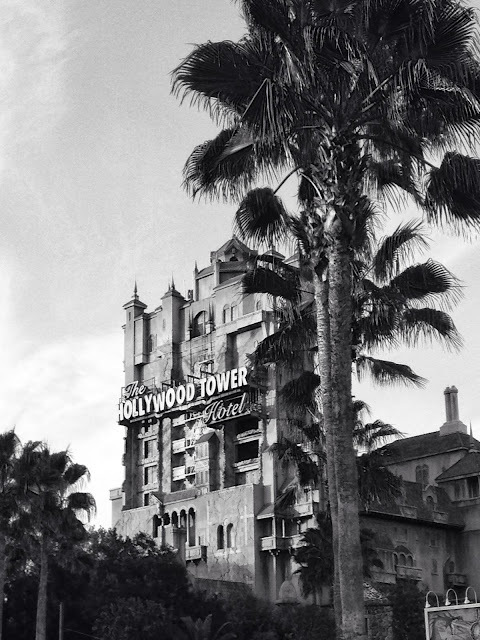 Since the story of this attraction takes place in 1939, I thought it was appropriate to make it a black and white photo. The Casey Jr. Splash and Soak Station is located in the heart of Storybook Circus. It is a great spot for young kids to cool down on a hot day. Like so many attractions, Casey Jr. Has a great detail that is overlooked by 99 percent of park guests. The numbers on each car represent the year that each Walt Disney World park opened. You can see that this car has a "71" on it for the Magic Kingdom's opening year. The other cars have an 82, 89 and 98 on them. I have to give credit to my friend Brent Dodge for this fact. I learned about it while reading his new book, A Closer Look: At the Magic Kingdom's Fantasyland. This morning I had the opportunity to spend a little time in the standby line of Jungle Cruise. Although this is not a true "interactive" queue like Haunted Mansion or Thunder Mountain, it is one of the first attractions to entertain guests while they wait. There are many funny signs and props to be seen here, as well as interesting audio to be heard throughout the area. 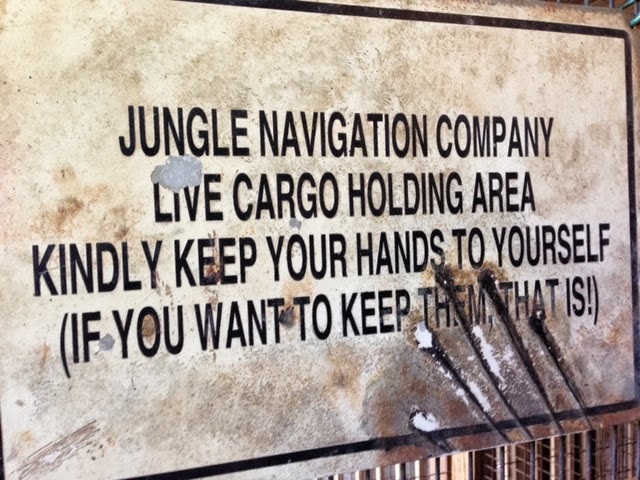 This sign can be found shortly after entering the queue. Recently, our seven year old son took an interest in Walt Disney......the man. Yesterday, I thought it would be fun to take him over to Walt Disney: One Man's Dream at Hollywood Studios. He absolutely loved learning about Walt, and we spent close to an hour in the attraction. 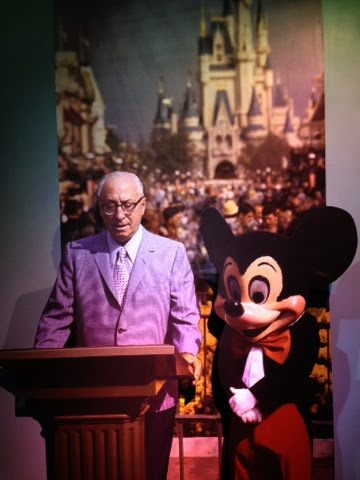 This full size cut-out of Roy and Mickey depicts Roy's speech at the dedication of Walt Disney World on October 25th, 1971. You can hear the speach when standing in front of this area. It is located in the back left corner of the exhibit, not far from the Walt Disney Theater. 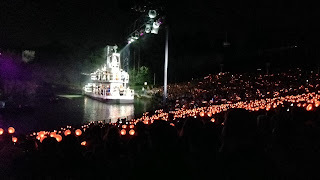 Tonight we say happy 15th birthday to Fantasmic at Hollywood Studios. This "fireworks and water extravaganza" has been entertaining guests since October 15th, 1998. Disney decided to commemorate this occasion by using the Glow With the Show ears for the first time at Walt Disney World. This unique headwear syncs with the music of the show and creates an amazing effect when many people in the audience are wearing the "ears." They have been used out in Disneyland (with World of Color) for a while, but tonight marks their Florida debut. Since it was opening night and Disney was filming it, a large number of guests in the center section received free ears. However, they usually cost $25. For the lighted ears to have an impact on the show, there needs to be a good amount of guests wearing them. Unfortunately, if Disneyland is any indication, opening night will be the only time you will see this amazing effect at its best. Moving forward, there will more than likely be very few ears worn on a nightly basis. However, it was quite a sight to see for those who were there tonight! Due to the success of Pixar's Up, Disney has added several elements of the film to Animal Kingdom. Two of the main characters, Dug and Russell (pictured here), greet guests on Discovery Island, next to It's Tough to be a Bug. 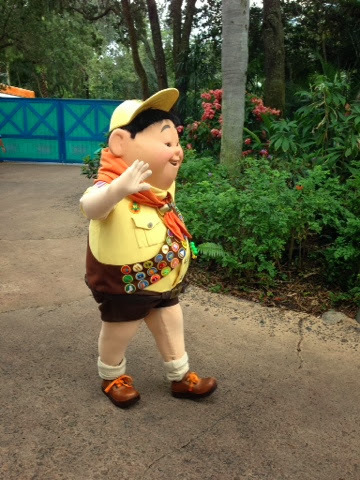 There is also a new scavenger hunt style activity called Wilderness Explorers, that allows guests to collect "badges" as they enjoy different areas of the park. I took this shot of The Rivers of America a few days ago. I was standing on the western shore of Tom Sawyer Island, looking toward Big Thunder Mountain Railroad. This section of the River would be considered the Colorado. Back in the old days, the dock across the river was home to The Davy Crockett Explorer Canoes. After enjoying the Food and Wine Festival at Epcot tonight, my family and I decided to head into Future World on the path that takes you by the old Odyssey restaurant. I liked the way the sunset was was creating the mirror image effect on the water. I also liked the silhouette of the Imagination Pavilion in the background, so I snapped this shot. There is a peacefulness about this view that was offset by the tens of thousands of guests making their way around the Food and Wine Festival tonight. However, crowded or not, this event is one of my favorites! I had the chance to spend some time exploring Tom Sawyer Island with my son today. There are many hidden treasures and interesting stories to be found here. 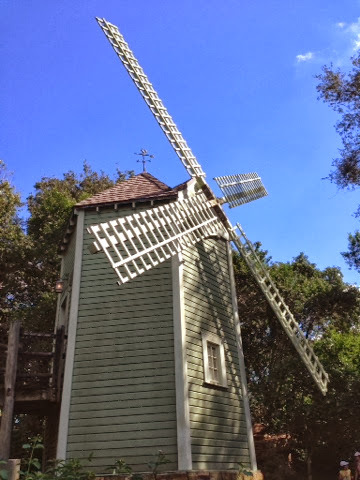 One of the not-so-hidden structures is Potter's Windmill, which can be found on the west side of the island, not far from the dock. Although the Wonders of Life pavilion at Epcot officially closed its doors on January 1st, 2007, it is still used for special events. One of those events, The Epcot International Food and Wine Festival, is taking place right now. Disney uses this location as the "Festival Center," but I like to visit it for nostalgic purposes. It contained several fun attractions, including Body Wars and Cranium Command. Although they will probably never re-open, I hope that Disney can once again find a permanent use for this pavilion. I took this picture today, while visiting Epcot with my son. I had the chance to sit very close to the stage in The American Adventure a few days ago. This was a great opportunity to take some pictures. This scene, depicting Teddy Roosevelt and John Muir, was from an actual event that took place in Yosemite in 1903. The detail on these audio-animatronic figures is amazing. When you watch this show, you almost forget that these are not real people. The American Adventure is one of the best representations of the history of our country that you'll find anywhere, and it should not be missed. My son and I visited Dinosaur over at Animal Kingdom today. He is studying fossils in school and I thought this would be a nice little field trip. It is amazing how many educational opportunities can be found around Walt Disney World. After exiting the ride, this large mural is seen as you are entering the gift shop. It displays many extinct animals, and even shows some endangered species on the verge of extinction. Last week I posted a picture from the "Chase Lounge," which is a place for Disney Visa card holders to relax during the Epcot Food and Wine Festival. The other spot in the park that is a perk for card holders is the Disney Visa Photo Place, in Innoventions West. This location is open all year long and allows guests to get a free picture taken with random Disney characters. 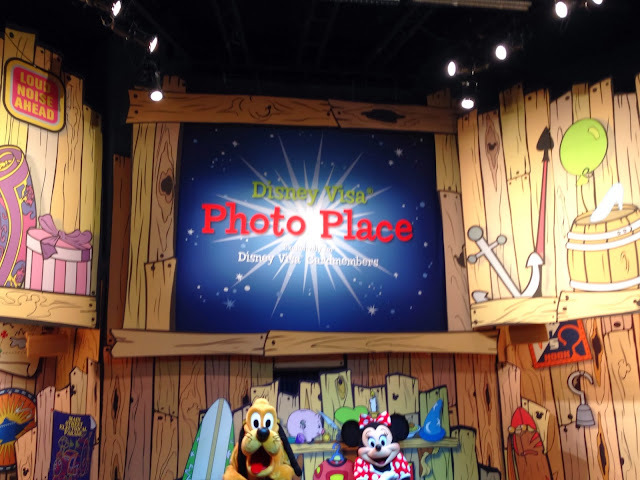 Today, I had a shot taken with Minnie and Pluto, along with friends and family. This "meet and greet" is a fun experience if you are passing by with a Disney Visa card! Whenever possible, I like to get pictures of things at Walt Disney World that aren't seen everyday. Today, I had the opportunity to take such a shot. There is nothing special or unique about the Polynesian boat dock. However, the boat that was docked there is one that is not normally seen at this resort. 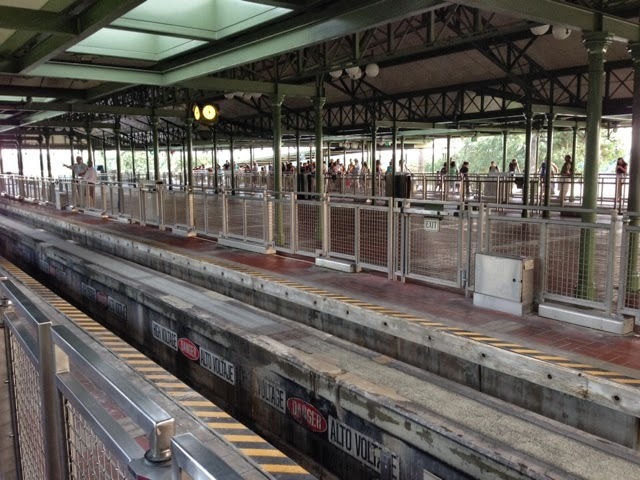 Typically, the smaller "Motor Launches" carry guests from the Poly to the Magic Kingdom. 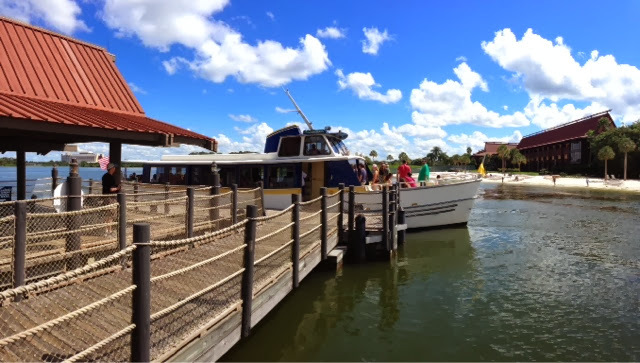 Since the monorail line was down for scheduled maintenance, Disney was using the larger "Motor Cruisers" to carry more guests across Seven Seas Lagoon. The other day, I had a 5 year old tour guest who wanted to meet Merida. Since the newest Disney princess is very popular, we headed over to Fairytale Gardens early in the morning. This is a fun experience for any fan of the movie Brave. 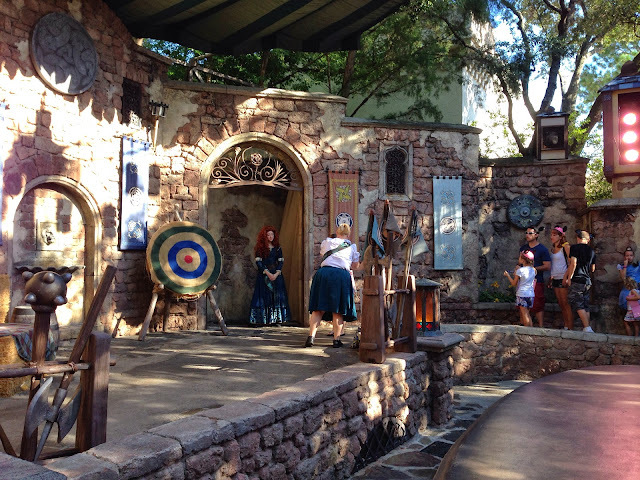 In addition to meeting Merida, guests can get a brief lesson in archery. This is a highly themed experience that shouldn't be missed, especially by fans of Merida. This shot is one of those that I snapped because of the way the sun was shining. 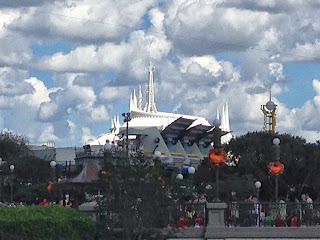 I liked how Space Mountain was "illuminated" behind a Tomorrowland that was mostly in the shadows. I was waiting for my tour guests in front of the Crystal Palace when I took this picture today. There are a few perks given to Disney Visa card members at Walt Disney World. One of them is access to the "Chase Lounge" during the Epcot Food and Wine Festival. This is a nice place to come and relax, grab a complimentary beverage, and even charge your cell phone. Last year, the lounge was located in the back of the old Wonders of Life pavilion. This year it was moved to the third floor of The American Adventure. I had the chance to visit this location today with my family. It was fun to be in a spot that is normally used for private parties and corporate events. There were also some amazing views of Epcot from up there. Today we say Happy 42nd Birthday to the Liberty Square Riverboat attraction, which opened on October 2nd, 1971. This was the day after the Magic Kingdom first opened. 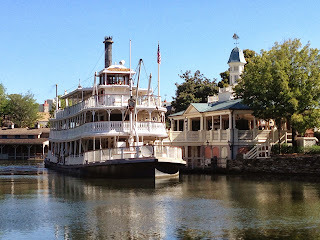 Although the original boat, the Admiral Joe Fowler, is no longer in service, the current "Liberty Belle" has been cruising the Rivers of America since 1973. It was originally called the Richard F. Irvine before undergoing a major refurbishment in 1996, when it was renamed the Liberty Belle. 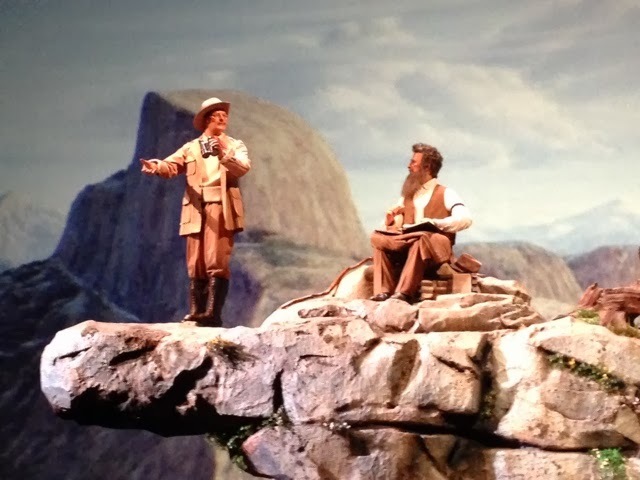 I took this picture today, as my tour guests were enjoying the Country Bear Jamboree. Today we say "Happy 42nd Birthday" to Walt Disney World. On October 1st, 1971, the Magic Kingdom opened its gates for the first time. It is still the most popular them park in the world. In honor of today, I decided to post a picture of the most photographed spot in the world. I took this picture of the Magic Kingdom entrance yesterday afternoon.